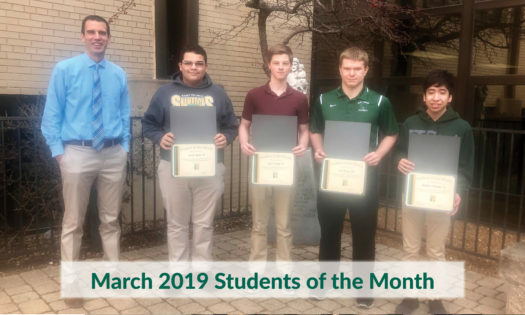 Saint Patrick High School is pleased to announce the following Shamrocks have been named Student of the Month for February 2019. Reason for Nomination: Jack has been a leader in the classroom. He learns new material quickly and then helps his classmates. And he always does so with a great attitude that makes the classroom atmosphere very safe and welcoming. Reason for Nomination: For his leadership role in initiating and organizing the Fall and Spring Open Mic Nights. From start to finish Xavier worked hard to make the event a success through recruiting performers, setting up, running the show and organizing cleanup. By creating a welcoming and inclusive atmosphere, Xavier demonstrated what it truly means to be LaSallian and a Shamrock. Reason for Nomination: Matthew is currently excelling in Digital Music. The work that he has submitted has surpassed expectations and he works diligently, every day in class. He is hard working and is a pleasure to have in the classroom. Reason for Nomination: Over the past 2 months Eric has stepped up as a class leader. When I ask him to help me with something he does it without questioning or even a groan, in fact he does it with a smile. When I ask for a volunteer to help he is always the first to volunteer with zero expectations of a reward. He not only is helpful to me but with his classmates as well. Whenever I pass him in the hall he is quick to say hello and asks how my day is going. The respect that he shows towards me and other adults is top notch.